After being tested in Google Apps, the offline version of Google Calendar is now available for all Google accounts. 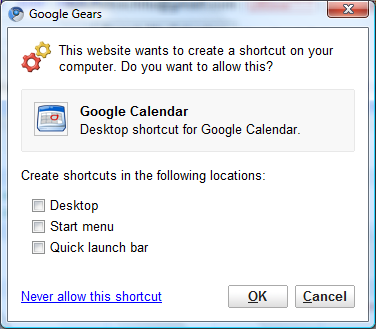 To enable it, you should click on "Offline (beta)" in Google Calendar's header, install Gears if you don't already have it, allow Google Gears to store information on your computer and then wait until the data is downloaded. In the Offline Settings page, you can select the calendars that are available offline (by default, only the main calendar is enabled). "You'll be able to view events scheduled on these calendars the next time you access Calendar offline. Please note that calendars containing web-content events will not display correctly while offline," explains the help page. Unlike the offline version for Gmail, the offline Google Calendar has many limitations: you need to manually go offline/online, you can't add events, edit the existing events, search your events or change the settings. Another limitation is that Google doesn't download all the events - I noticed a warning: "Your offline calendar only contains events from Feb 4, 2009 to Jun 4, 2009". The read-only offline version of Google Calendar is only useful to quickly check your agenda when you don't have an Internet connection. For more features, you should check Mozilla Sunbird, a cross-platform tool that can synchronize with Google Calendar using CalDav. Make sure to enable caching if you want to view the events from Google Calendar when you are offline (you still can't edit the events or create new ones). Well, restrictions abound but its a good start. Enable was quick, simple, Google. 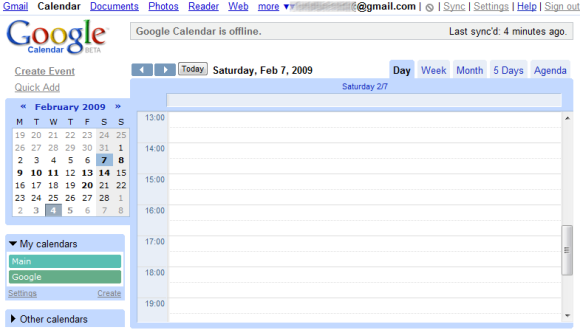 I ended up removing the "offline" feature from my Gmail, Calendar, and Docs. It never worked right for me. It always took time to sync up. Sometimes I would stare at a old unrefreshed screen when in fact I had a live internet connection. There were many other problems as well. I am much happier now with the offline gone. For me these offline features are great, not only for pure offline, but often for unstable connections, I plug in to a lot of networks and some are more reliable than others. I never really used the calendar, but I think I'll give it a try now. so it's a Beta feature for a Beta product? surely that's inferred, as all features within Google Calendar (still in beta) are, by association, in beta. 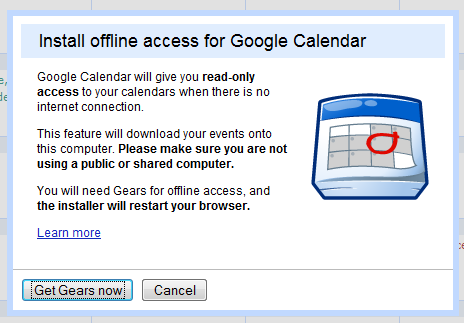 I use Google Calendar as my primary Calendar application and having it now also offline is of a great value. I don't see an offline option anywhere in the interface. Is it being rolled out in phases? Is it me or is this a step back from cloud computing? Seriously, I access google docs from my work desktop, work laptop, blackberry, truck laptop, home laptops (which I have 3), home desktop, my parents laptop when I am at their house, somehow these would be all offline as well as online and would require resyncing. I can switch from anyone of these pc's to another one in a matter of minutes. It's why I got away from Outlook. Now we are heading back that direction. No thanks. I don't want to wait each time I get online for docs to prefetch emails and such thinking I might read them. I would much rather fetch the individual email when I want to read it. It's a huge waste of bandwidth to prefetch emails in a attempt to second guess whether or not you are going to read it. I normally average around 100 emails a day which includes work mail and personal. Thank God you can disable it. If you couldn't this would have been the deal breaker. Does anyone understand what I am getting at? Leave it in the cloud!! I don't think anyone is holding a gun to your head. It's there for people who need the feature; everyone else is free to ignore it. Would you prefer not to give people the ability to make their own choices about how they use these tools? I don't think anyone is holding a gun to your head. I never said anyone was. Did you read my post? It's there for people who need the feature; everyone else is free to ignore it. Would you prefer not to give people the ability to make their own choices about how they use these tools? I apologize. I must have misread what this comment box was for. I could have sworn it read "What do you think?" and proceeded to write what I thought. Why get personal? Did I touch a nerve Matt? Amazing! I have been waiting for the Calendar to go offline for a long time. This will help me alot, thx! WHat good is that without editing offline? There are myriad of applications to sync calendars for offline 'viewing'. If google had to do the same, whats the difference? What I think the majority of us are waiting for is an outlook type functionality with a google sync to the cloud inherent capability. I want to update anything anywhere and have all of my devices constantly synced and have offline capability ala exchange. When you accomplish that ... I'll be impressed. There are many options to sync your calendars with different applications and devices, including Outlook and Windows Mobile. Google Calendar also has an API that allows third-parties to develop cool apps like Spanning Sync or GCalSync. 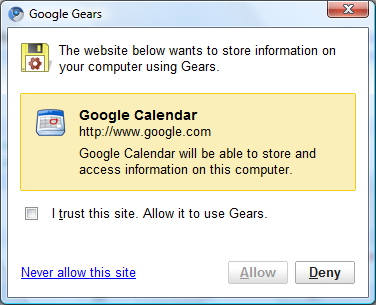 I don't see how you guys can be happy about Gears support for gcal. It's useless if you can't edit the calendar in the offline mode. wish it had the search and print capability offline then it would be good for me. I loaded gears on my windows mobile 5 mogul device and I can not find how to activate the offline calendar mode. Is this mode not available for windows mobile 5?? I may recommend Azotix Active Organizer - third-party software which gets you ability to work with Google Calendar and Contacts offline. It is now two years since the offline function was introduced and you still can't do anything with the calendar when you are offline. It is time to fix it so that the offline calendar is actually useful and not just for show! Here it is December 12 2012 and the offline calendar still does not download all my events. I Give up.